Buti nalang bongga kayo! From my BB reviews and all, ayan! A company from Japan made me review this. Actually, super excitement lang kasi this one is maingay na sa hollywood and i always wondered ano ba itey! I like going to Flawless for treatments, but if bet nyo sa balur ituloy ang saya. check out these home masks from Japan. There are actually 2 kinds with variants. 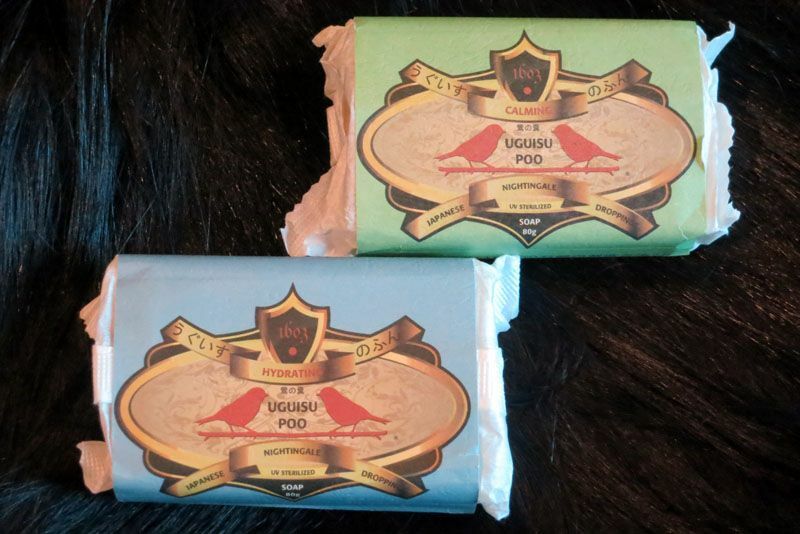 The 2 kinds are soap or the powder. 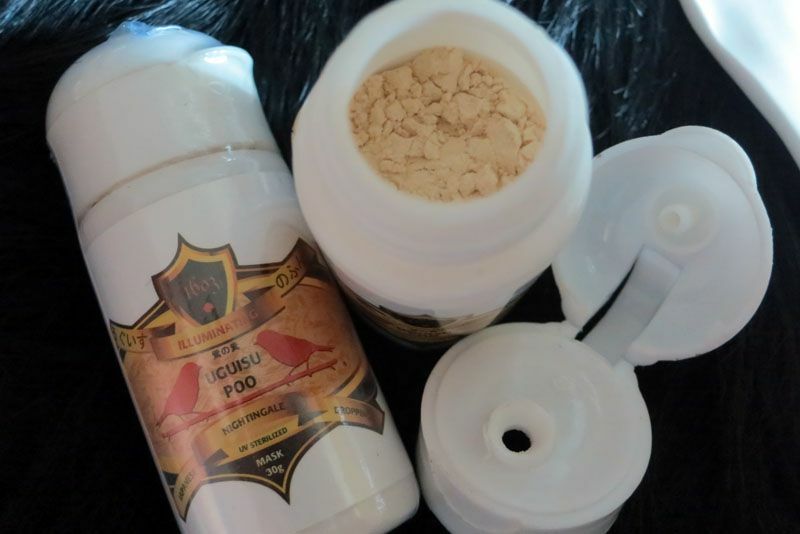 The powder can be used as a mask, or scrub. Ok, more fun sya! D ko gets bat no fun nakalagay. hahaha! Well maybe because it was derived from Japanese Nightingale droppings… or in IC Mendoza’s world boe na naman! Don’t worry, i researched that it is processed well and all so waley na ang ammonia, uric acid, and dead bacteria debris. And since na try ko, inamoy ko narin. Hindi sya mabaho. haha! This whole process were actually used by the geishas from ancient time. So tried and tested. This is para sa glow na hanap nyo. I tried it after my facial from flawless. One bottle an actually last a long time kasi half teaspoon lang mixed with water. Once ko palang nagamit but bongga sya sa texture. They said increase use over time will improve pore size, discolorations, acne stars and complexion. So they have different types depende sa bet nyo for your skin. Pero if tamad kayo magmask or mix mix ganap. You can check the soap. This method was from the 1600s Edo era. So matagal na talaga. 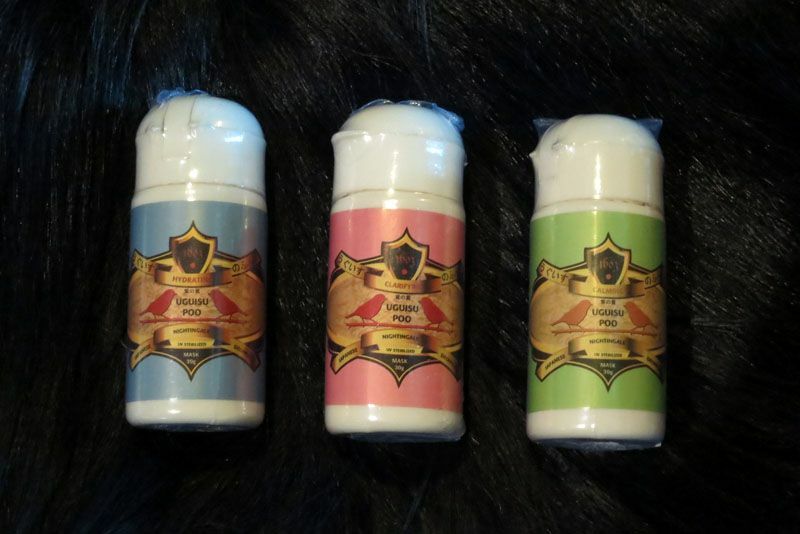 As i said used by the Geishas, kasi d ba buong araw silang naka pintura sa fez? 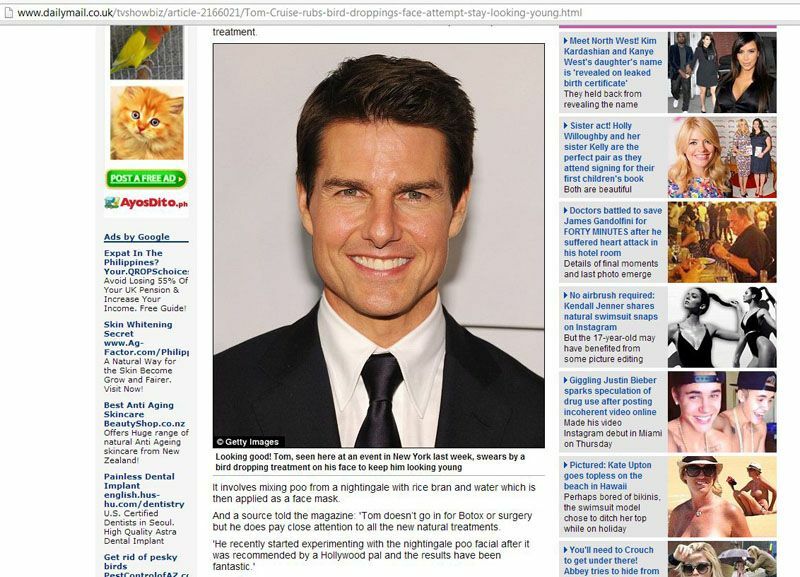 They found this to be the best was to clean their pores and keep their bonggang complexion. Oo nga naman, i think medyo powerful itey kasi kung buong araw sila naka extra light funda, malamang clogged pores yun. So anyhow, eto nga. Remember when Posh Spice medyo acne levels? Hindi ko sya nilalait ha! Love ko yun! Nabasa ko pa inamin nya sa book nya yun, na big prob sa kanya. I don’t know how accurate these photos are but I really remember her sa spice girls na minsan may chismis. Part of the Bird Poop Facial at New York’s Shizuka Spa, and the rather more romantic-sounding Geisha Facial at London’s Hari’s, the unique ingredient is said to leave skin with a healthy shine as it acts as an exfoliant. 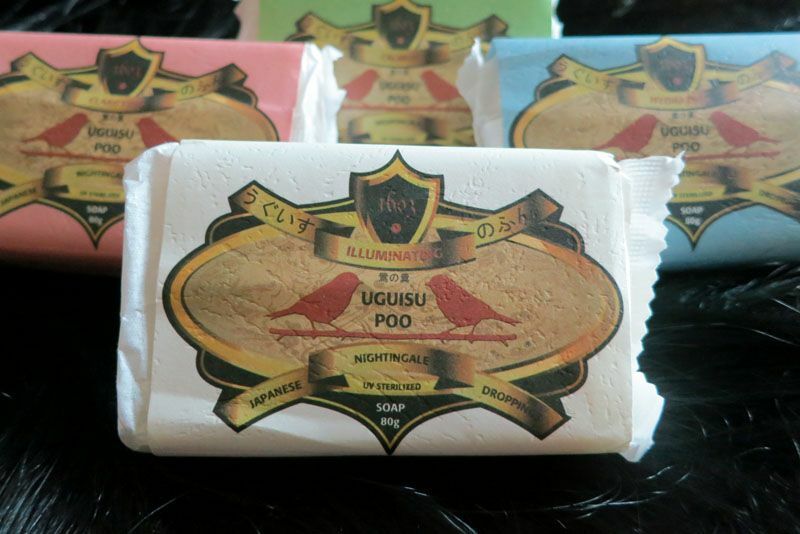 Dried under UV lights, the excrement is mixed with rice bran and water in the spa and applied as a face mask. 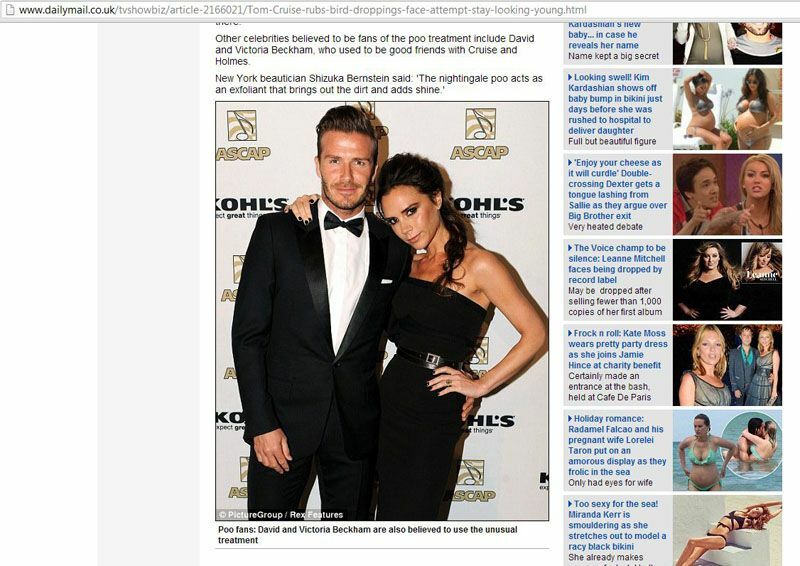 The £135 treatment is nothing new to the A-list, however – David and Victoria Beckham have both long been fans. Speaking to a magazine, a friend said: ‘When Victoria was in Japan she was admiring the local women’s clear skin and discovered it was down to these facials. 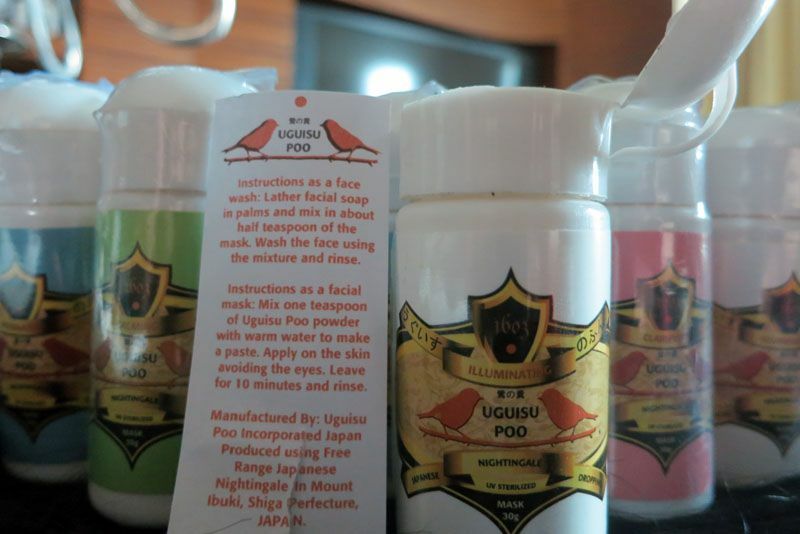 Known in Japan as uguisu no fun, the facial was conceived in November 2007 by New York facialist Shizuka Bernstein, who was inspired by her mother describing how geisha girls in feudal Japan removed their thick white lead make-up. Mrs Bernstein, 52 explained: ‘The bird poop facial works because of an enzyme that breaks down the dead skin on the upper layers of the face. 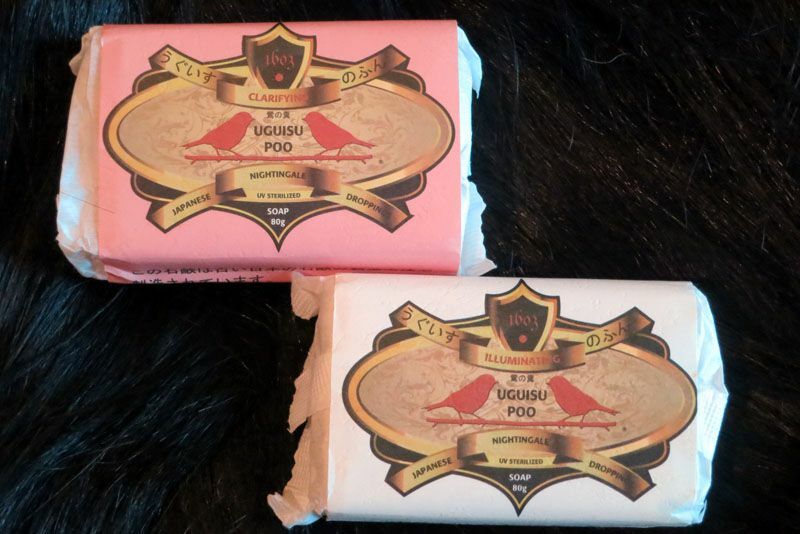 ‘The nightingale poo acts as an exfoliate that brings out the dirt and dust that builds up in the skin and leaves the customer feeling refreshed. ‘In addition, it is thought that the bird poo contains guanine, which actually occurs in pearls. ‘I couldn’t believe that a facial existed that contained bird poo,’ said Rachel Marshall, 22, a client at the Shizuka Spa. Isa pa tong si Pareng Tom who joined the fun! Madaming ng fake, so to get your money’s worth.. make sure to buy direct. Don;t worry they ship to Manila! Door to door pa!